The days are getting longer, the sun setting later, and with that comes the opportunities for real after-work hikes, expanding the time to explore the trails beyond my usual weekend availability. On Thursday, May 18 I decided to take the opportunity to forget about the news for a bit and do something more productive instead. We’ve been experiencing higher temperatures the week; it had been a relative scorcher by May standards with highs in the mid-80’s in the valleys. So I found myself seeking out trails in the higher elevations. The Craggy Gardens area on the Blue Ridge Parkway is one the quickest such areas to reach from Asheville, and I’d been meaning to re-hike to Hawkbill Rock with a decent camera for a while now, so that’s the one I chose. 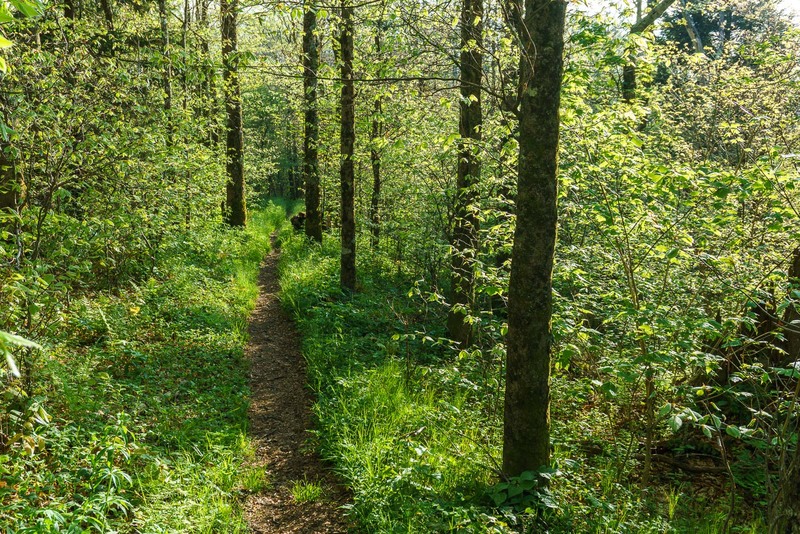 The start of the trail, which leads past a meadow near Beetree Gap, gave me reason to be excited, as the new spring growth’s bright green combined with the early evening sun made for a beautiful scene that would extend all the way to Hawkbill Rock. Spring wildflowers such as Trillium were still blooming heavily at this altitude, carpeting the forest floor in places. 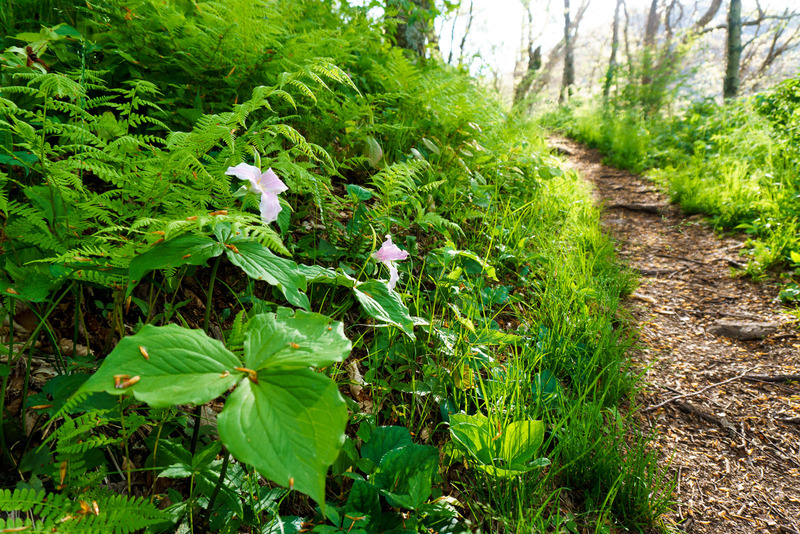 As the trail wound its way up the steep slopes of Snowball Mountain, which tops out at about 5375 ft., I began to see some beautiful pink trillium and another species I wasn’t as familiar with, growing straight up out of patches of galax on the ridge top. Large patches of blue-bead lily were also in bloom, flowers numbering in the hundreds. The velvety pinkish leaves of red oaks were just beginning to unfurl while some American beech trees were still clinging to last year’s leaves with swelling buds. It is an absolutely magnificent stretch of trail. The trail runs below the north slope of the ridge along much of this stretch, through a strip of forest containing Red Spruce trees. Though I suspect much of the Craggies were once covered with Red Spruce in the past, this type of forest is found more prominently in places such as the Black Mountains, the Balsams, and the Great Smoky Mountains. This particular patch of the conifers stretches from near the Craggy Gardens picnic area to the northwest side of Snowball Mountain. Though the forest is mostly northern hardwood species with red spruce intermixed, there are a few patches where the spruce have become dominant. These trees were rather inconspicuous in the Craggies until about the last decade or so, growing slowly below the hardwood canopy for many years. But they now seem to be doing quite well. When they finally started popping out above the hardwoods it looks like their growth accelerated in their newly-acquired sunlight, and they’re now much more visible from the Parkway than they were in years past. Some are getting fairly large. Some more small patches of Red Spruce occur on Craggy Dome and Bullhead Mountain north in the Craggies, before the spruce-fir dominated areas farther north in the Black Mountains around Walker Knob. As far as I can tell, there are no Fraser Fir growing in this area, only Red Spruce. It also looks like these spruces sprouted during a period of better germination; there are no seedlings in the understory like there are in many parts of the forest that have a spruce/fir component. Past the summit of Snowball Mountain, the trail angles back West along a gently descending ridge line. This area is dominated by smooth, straight American beech, with grasses or grass-like sedges on the forest floor. Bathed in the lowering sunlight, the newly-emerged beech leaves glowed an otherworldly green. Beyond the beech-dominated ridge, the trail wraps more to the south and passes through a switchback, and into an area where the larger trees were still nearly bare. Loads of sunlight poured through the branches, illuminating the spring ephemeral species and giving them much needed energy for just a few more days before the canopy closes in over them. The contrast between the gray branches above and explosive green below was just stunning. 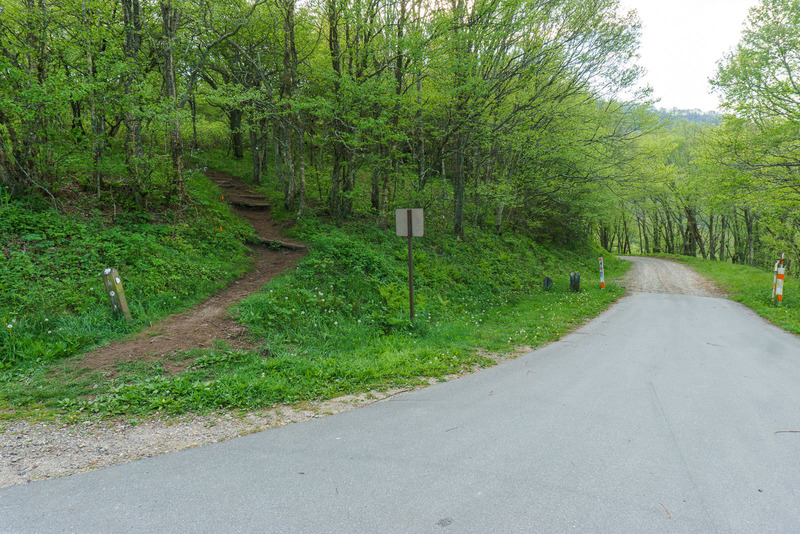 Past the switchback, the trail begins an earnest descent down a knife-like ridge, where more acid-loving species like Galax and Mountain Laurel grow. Descending a final set of steps into a gap between Snowball Mountain and Hawkbill Rock at the head of Reems Creek, I entered an area where the wind really started picking up. The cooling breeze felt great; thunder rumbled somewhere in the distance. It was warm enough that the threat of rain didn’t deter me much as I started up the last pitch to Hawkbill Rock. It’s only a short climb up to Hawkbill from the low point on the trail but it’s a fairly steep one. There’s even a scramble up an angled rock outcrop at one point, somewhere just shy of being steep enough to need to use your hands to ascend. A limited view opened up at the top of the first climb, inviting me to stop and soak it in. But I knew to keep going, because it gets even better higher up! In just a short distance I reached Hawkbill Rock, on the left, where a better view awaited from cliff-top rock face. You don’t get a 360 degree view from any one spot up here, but between the various overlooks you get about 270-degree coverage of the horizon. With the setting sun’s light shifting toward the warm end of the spectrum, and the spring colors unfolding from mountain top to valley bottom below, I was sure glad I brought the camera this time! The trail continues past Hawkbill Rock but that was my intended destination – I went just far enough past the rock to see that there were some early blooming Rhododendron farther up the trail. I returned to the rock to enjoy watching the last hour or so of sunlight playing out on the side of the Craggy Mountains to my east before heading back to the parking area as clouds and fog began to envelop the summit of Snowball Mountain. I knew I’d have to move fairly quickly but between the last few minutes of sunlight and the season’s long period of dusk, I made it back to the parking area with plenty of daylight to spare. 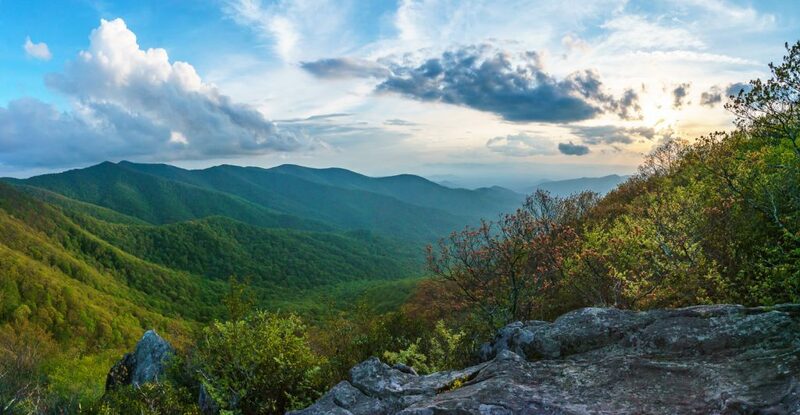 I would highly recommend this hike for anyone looking for a less-popular excursion in the Craggy Gardens area, who isn’t deterred by some steep and rocky sections of trail.